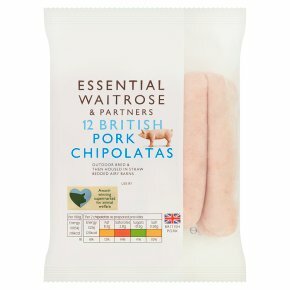 INGREDIENTS: pork (67%), water, fortified wheat flour (wheat flour, calcium carbonate, iron, niacin, thiamin), salt, stabiliser (diphosphates), white pepper, yeast extract, preservative (sodium metabisulphite), nutmeg, ginger, raising agent (ammonium carbonates), sage extract, thyme extract, beef collagen casing. Grill Time: 12-15 mins. Grilling Instructions: Preheat grill. Remove all packaging. Place under a medium grill, turning occasionally until thoroughly cooked, the juices run clear and there is no pink meat.